Grayson Perry was catapulted into the public consciousness in 2003 when he won the Turner Prize, accepting his award dressed as his transvestite alter-ego Claire. A unique figure in the international art scene, Perry is best known for his ceramic coil pots which he adorns with subject matter ranging from his childhood in Essex, his transvestism, and his reflections on British art and society. Perhaps less recognised is Perry’s role as a curator. 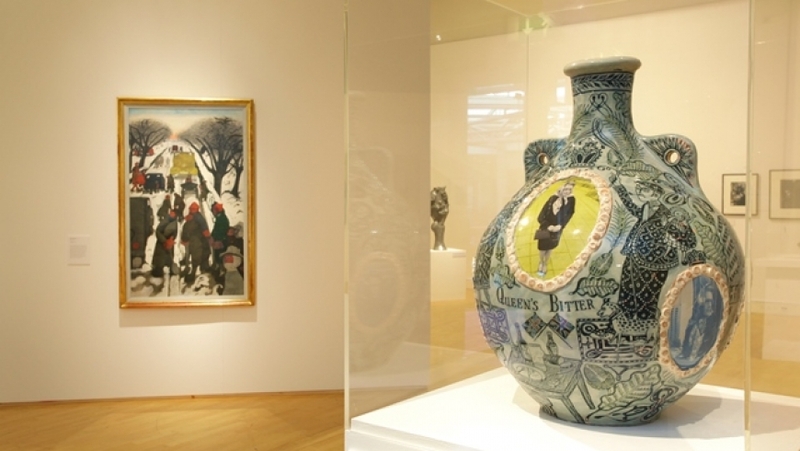 This exhibition highlights this recent aspect of Perry’s practice and offers a unique and personal view of the Arts Council Collection. Perry’s selection will be presented alongside new work made by him in response to the Collection. Perry’s selection features modern British paintings, sculpture and photographs that embody a quiet nostalgia and restraint. Rather than retreat into a world of rose-tinted romanticism, Perry presents an alternative view of British art, one that reassesses the relationship between past and present, and questions the boundaries between the radical, the conservative, and the radically conservative. Michael Andrews; Kenneth Armitage; Frank Auerbach; Gerry Badger; Clive Barker; Elinor Bellingham-Smith; John Benton-Harris; Ian Berry; John Bratby; Edward Burra; Anthony Caro; Lynn Chadwick; Robert Colquhoun; Elisabeth Frink; Duncan Grant; Bert Hardy; Anthony Hatwell; David Hepher; Barbara Hepworth; Thurston Hopkins; David Hurn; Bryan Kneale; Margaret Lovell; Alan Lowndes; L.S. Lowry; Henry Moore; Francis Morland; Tish Murtha; John Myers; Paul Nash; Eduardo Paolozzi; Martin Parr; Victor Pasmore; Christine Pearcey; Edwin Pickett; John Piper; Tony Ray-Jones; Alan Reynolds; Brian Robb; William Roberts; George Rodger; Leonard Rosoman; Meg Rutherford; William Scott; Jack Smith; Ruskin Spear; Homer Sykes; William Turnbull; Patrick Ward; Carel Weight; John Wragg; Bryan Wynter.